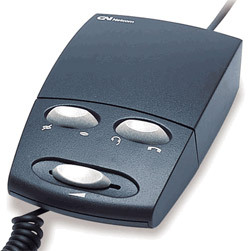 If you use a headset for both telephone and computer, GN Netcom has you covered with the GN 8050-TCA. Not only does the GN 8050-TCA work with just about any phone with a modular connector, it also plugs right into any Sound Blaster-compatible PC and lets you switch between your phone and your computer with a single click. So it's the perfect amplifier for anyone who uses applications like computer-aided training or speech recognition. Everything about the GN 8050-TCA showcases GN Netcom's technology leadership. With advanced features like Voice Switching to reduce background noise and maximize speech recognition performance. Voice Compression for a consistent, user-friendly volume level and top-of-the-line hearing protection. Our exclusive, user selectable battery-save feature. Plus an online indicator option that conveniently doubles as a headset stand. Yet for all these advances, the GN 8050-TCA is as easy to set up as it is to use.